A cold front has cleared the area. 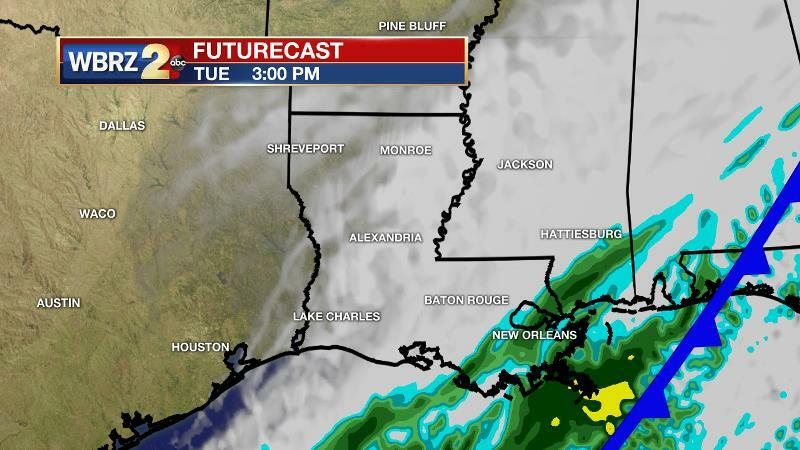 Clouds and showers will linger while the coldest air so far this season surges toward the Gulf Coast. Today and Tonight: Showers are expected to linger well into the morning hours of Tuesday, with cloud cover remaining stubborn through much of the day. Therefore, temperatures are not expected to move much and will be stuck in the low to mid 40s. North winds of 10-15mph will create wind chills or “feels-like” temperatures in the upper 30s. High pressure behind the front will begin to break cloud cover overnight but the timing of when skies fully clear will have a significant impact on temperatures. At this time, enough cloud cover is expected to remain to hold most thermometers just above freezing into Wednesday morning. Up Next: Strong northerly winds will overcome any sunshine on Wednesday to keep highs in the 40s and with much more clearing Wednesday night, our first freeze of the season is expected by Thursday morning. Sunny skies will contribute to temperatures slowly warming through the week, with 60s setting up on Friday and Saturday. The Tropics: Disorganized showers and a few thunderstorms are moving through the Leeward Islands associated with a tropical wave interacting with an upper-level low. Strong upper-level winds and interaction with the islands of the Greater Antilles, while the system moves generally westward, should inhibit tropical cyclone formation. Regardless of development, this system is expected to bring locally heavy rainfall to portions of the Leeward Islands, the Virgin Islands, and Puerto Rico over the next few days. Tuesday will be a cold and rainy day. Up until Sunday, models were clearing the frontal system out rapidly. Now, there is good agreement that the associated upper level trough axis will slow its eastward progression as low pressure develops at the base of the trough. Due to the position of the through west, deep southwesterly flow of tropical moisture aloft is riding over cold, northwesterly surface winds. 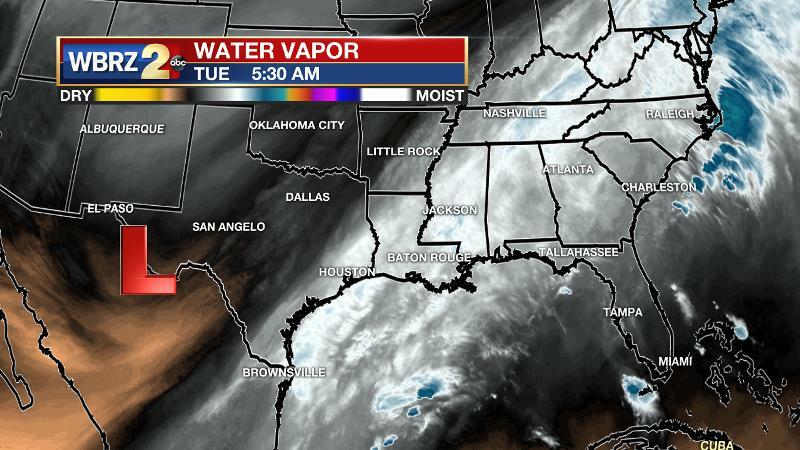 This will result in cloud cover and showers hanging on through Tuesday. 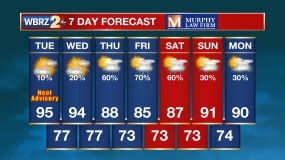 Thus, rain has been extended into the forecast to last through the second day of the week. While amounts should not be significant, measurable rain is anticipated for 70-90 percent of the forecast area. With stiff northerly winds behind the cold front, plus ongoing clouds and showers, thermometers will not move much from the low 40s and wind chills will be in the upper 30s. Showers will be ending from west to east on Wednesday morning as the upper level low moves across northern Louisiana and southern Arkansas. Lingering cloud cover may provide assistance in keeping temperatures just above freezing, especially along and south of I-12. The post-frontal air mass will be well entrenched by Wednesday though and highs will struggle to get out of the mid 40s with lows close to freezing by Thursday morning. The remainder of the week and into the weekend looks like a dry forecast as high pressure builds in at the surface while troughing stays in place aloft. A reinforcing cold front is pegged to swing through early Sunday, keeping temperatures below average.